I think that blogging about your wardrobe forces you to notice patterns, patterns which you may not have been aware of before. For example, I seem to be wearing a lot of mustard lately. It's not my favorite color, but it does seem to complement a lot. As a condiment, I don't really care much for mustard. 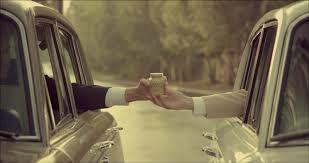 Although I do really like the Grey Poupon mustard commercials. Did you know they made a sequel to the original from the 80s? It aired during the Oscars and was quite amusing, perhaps more so than the Oscars themselves. Well, this skirt has a touch of mustard in it and I chose to wear it with a mustard colored sweater. The Crosshatched Ruffle skirt from Anthropologie received sort of mixed reviews due to its puffiness. I agree that it is pretty voluminous in the hips, which is why I sized down from a 4 to a 2. This seemed to help the puffiness problem a bit. Plus I liked the print and the abstract pattern, so I was willing to overlook at little extra volume in this area. I paired the skirt with a striped shirt as shown online and a black satin bow belt from Rodarte for Target. While the skirt isn't perfect, I definitely feel like I could roll up in a Rolls Royce and ask, "Pardon me, would you have any Grey Poupon?" Oh i love the accents of mustard in the skirt - and that bow is too cute! Thanks! If it makes you feel better the weather turned rainy and cold today too, back to sweaters!